On hearing the news that Sugar will be performing Copper Blue in it's entirety at the San Francisco's noise pop festival next month, I just had to find my copy and give it a whirl. It's been 20 years since the album was released hence the special show and hopefully an International tour of the special show (please??). I still have my brother's CD copy but I think it's high time I committed this album to my vinyl collection. 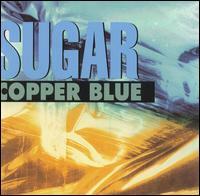 Copper Blue is an excellent example of an album in the original definition. It flows. It works. There's a special driving timeless energy that I find so refreshing every time I listen. I used to find a similar quality in some of the early REM albums such as Automatic for the People and Out of Time. If I had to take one or two songs off the album and put them in a play list they would still sound good, but if you listen to them as an album they somehow hold more power. It's almost as if you have to go to planet 'Copper Blue' to get the full experience. Instead of just having one or two great tracks as a lot of albums only seem to have these days, there's an overall standard carefully crafted into every track on this album. From the spine tingling chord changes of Hoover Dam (my favourite), to the feel good groove (and tribute to the Pixies) of A Good Idea, Copper Blue is crammed full of so many little intricacies, subtleties and layers and yet it can still sound so simple. I really hope to be able to see this show.